Passover begins this Friday, April 22nd, and this year will be different for many Jewish families. For the first time in 800 years, conservative Jews are allowed to eat kitniyot. Don’t know what kitniyot is? Don’t worry. We’re here to help. First, we’ll tell you about this centuries old ban and then we’ll bring you a recipe for a version of kitniyot. Whether or not you observe this sacred day, you can enjoy this hearty and nutritious dish. It’s important to understand what kitniyot is. Although the word translates roughly as “legumes” or “beans,” it is often used to describe legumes and/or rice. In fact, when the ban was originally enacted in the 1200s CE, the word kitniyot was used to describe a number of forbidden foods, including “rice, buckwheat/kasha, millet, beans, lentils, peas, sesame seeds and mustard…as well as corn, green beans, snow peas, sugar-snap peas, chickpeas, soybeans, sunflower and poppy seeds.” This ban only applied to Ashkanazi Jews. Sephardic Jews have continued to enjoy these foods during Passover. The basic laws of Pesach are that one may not eat nor own any chometz (leavened bread) and one must eat matzah (unleavened bread) on the first night. By definition, both chometz and matzah hail from the five major grains: wheat, rye, oats, barley and spelt. The sages teach us that these grains can become chometz when they ferment. The fermentation of all other foods, whether we call them a “grain” or not, is considered a sirchon – rot – and not chometz. Since matzah must be made from a material that has the ability to become chometz, the Shulchan Oruch(O.C. 453:1), a central Rabbinic text authored by Rabbi Yosef Kairo, establishes the rule that matzah may only be made out of the five grains and “not out of rice and other types of kitniyos, and these will also not become chometz.”… The real concern with kitniyos on Pesach is not based upon their inability to make matzah, but rather on a custom discussed by some Rishonim, the leading rabbis in the 11th-15th centuries, regarding avoiding their use entirely on Pesach. While it would seem fine to eat foods that cannot conceivably become chometz, these authorities were concerned that kitniyos might in some way become confused with true chometz. First, cooked porridge and other cooked dishes made from grain and kitniyos appear similar. Second, kitniyos are often grown in fields adjacent to those in which chometz is grown, and these grains tend to mix together. And third, kitniyos are often ground into a type of flour that can easily be confused with chometz. For these three reasons, the rabbis suggested that by avoiding kitniyos people would be better able to avoid chometz. Boil lentils in 6 cups of water, then simmer for about 15 minutes until tender but not overly soft. 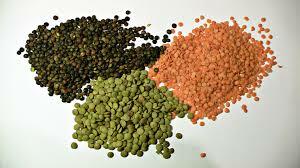 Drain lentils, then rinse with cold water. Drain well in the colander. Place lentils in a mixing bowl. In a small bowl, whisk together olive oil, fresh lemon juice, sea salt and cayenne. Pour the dressing over the lentils and add fresh chopped parsley to the bowl. Stir all ingredients together with a fork until the lentils are evenly coated with dressing and the parsley is dispersed throughout. Refrigerate in a covered container for about 30 minutes, or until chilled. Serve. Will last 4-6 days in the refrigerator in a sealed airtight container. This entry was posted in Blog, Bon Appetit Wednesday, Culinary, Culture and tagged ancient food, ancient history, ancient recipes, AntiquityNOW, kitniyot, lentils, Passover, rice. Bookmark the permalink.